PhD students present mini Three Minute Theses to the donors who generously support their projects. Honorary graduates and long-term donors to the University, alumnus Roger Whorrod OBE and his wife Sue, are giving £500,000 to provide opportunities to young researchers through a competitive programme of PhD studentships. In December, a special event was held to celebrate the success of the programme and its students, organised by the Department of Development and Alumni Relations. 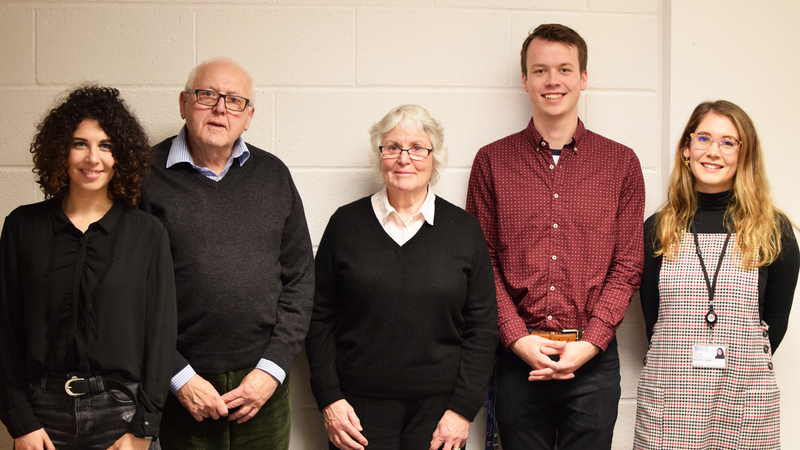 Inspired by the Three Minute Thesis (3MT) competition, the Whorrod PhD scholars, Valentina Macchiarulo, Matthew Slade and Kathrin Lauber, were invited to present and explain their research topics to Roger and Sue in just three minutes. However, unlike the real competition, Roger and Sue were more lenient on the rules, allowing more than a single PowerPoint slide and abstaining from disqualifying scholars who exceeded the time limit! Matthew presented his Chemistry PhD research, which is part of a £4m vaccine delivery project being undertaken by a consortium of academics from the GW4 network of universities. Half of all vaccines in developing countries are wasted due to the challenges in getting the vaccines safely and quickly to people in remote areas. He aims to develop vaccines which can be stored at room temperature, by encasing them in silica. Valentina then explained her research within the Department for Architecture and Civil Engineering, which focuses on satellite monitoring of displacement and damage to property, following underground construction. Valentina is working closely with specialists at NASA to assess damage along a section of the UK’s Crossrail alignment. Ultimately, her research will improve the assessment process, helping to make the construction industry more economical. Finally, Kathrin is working with Professor Anna Gilmore, Director of the Tobacco Control Research Group in the Department for Health, focusing on diseases caused by harmful use of alcohol, tobacco and unhealthy diets. Ultimately, Kathrin hopes to influence national health policy through her research. "Sue and I enjoyed the presentations very much... Next year we look forward to visiting them individually to explore their research in more detail." We look forward to holding a follow-up event next year, when Valentina, Matt and Kathrin will be joined by two more Whorrod Scholars. Find out more about securing funding for your PhD.